It’s the beginning of a new month and to be honest I feel like time is going by extremely fast! The good news is a new challenge is up at House of Cards! The theme of our challenge this time is Enamel Dots. I don’t own any enamel dots so I used a couple of matte black pearls that look a bit like them. My design was inspired by both the black pearls and this BEAUTIFUL printable from Nicecrane Designs. This sweet Sunbonnet Baby is from a new printable set called Restored Sunbonnet Postcards. I printed the file on white linen cardstock, fussy cut it and covered it with glittery glue to add interest to the image and also to protect it and make it a bit sturdier. I went for a retro vintage design, using different colors, patterns and elements to create a freestyle collage card. To make this and other similar layerings on my cards I pick a color palette based on the papers I have available, die cut various different shapes and adhere all the pieces. Sometimes I overthink the position of the different layers and sometimes it’s a spontaneous process, but I do like every single layer to show without overwhelming the focal point of the card, in this case the lovely Sunbonnet Baby. All the links to the supplies used are listed below so you can check them out! I hope you have enjoyed today’s post! Make sure you visit House of Cards to see what my talented teammates have created for this month’s challenge. I can’t wait to see what you make for this month’s Enamel Dots theme challenge! Thanks so much for stopping by today. Have a great week! I dont own too but I have order at Ebay yes its not cheap but I bought it and I like it to use that enamel dots..
great card and great post Gracie..how are you team mate..
Fab collage and a wonderful sentiment to go along with it! Like the shimmer on the girl! Have a great Sunday, teamie! How precious. I love Nicecrane Designs and you used it so beautifully. wow, this is gorgeous. I love the cute image and love all the glitter. Nice card and it is great to stamp the sentiment on the vellum. You made it well. very cute! Love all the layering. Lovely card, I love the layering. Oh my word Gracielle. This card is amazing. Love all the details you used. I love that sunbonnet girl! very sweet card! Hi Gracie! Love this vintage image. Sunbonnet Sue is one of my favorites. I am laughing at all our DT-mates who are using all kids of different things for “enamel dots.” (me included LOL) Your substitute works perfectly and your card is adorable! Have a great day. A fab vintage card. I love all the little pretty extras, especially the 'hug' tickets. 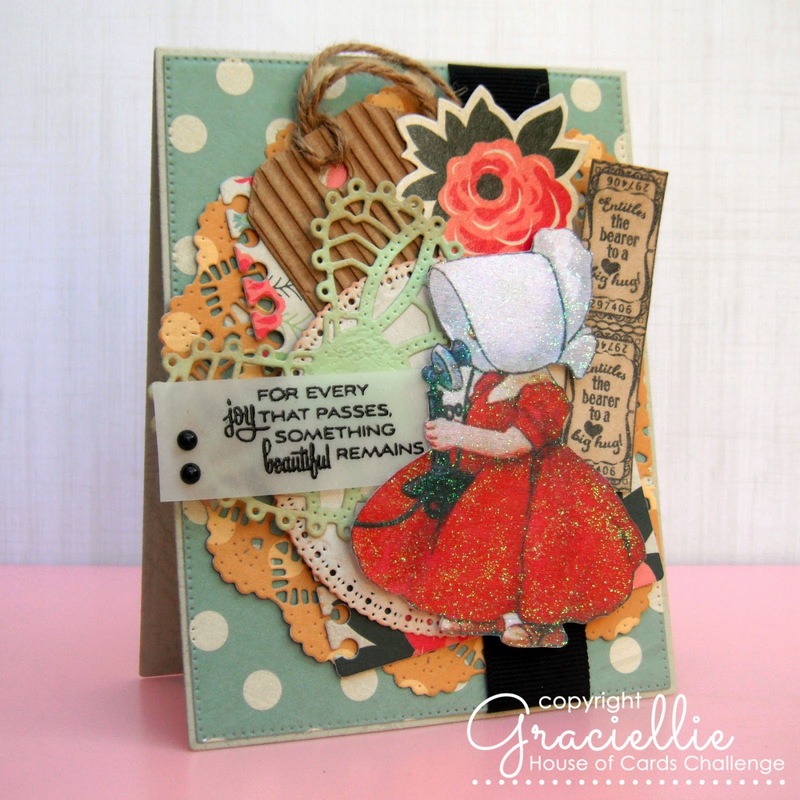 I love how you took so many different items and put them together to make cool, cohesive and gorgeous card! All those layers and perfect and SO beautiful!!! Thanks for sharing with us at Party Time Tuesday! Such a lovely card! The layers work well together! Very pretty! WOW this is stunning Gracie! I love that little girl image and all of the layers!! Fabulous sentiment too- it looks awesome stamped on vellum! Beautiful card! There are so many pretty details here! Your little enamel dots are a lovely accent – -perfect! Such a pretty collage! Love the shimmer on the girl! Lovely card Graciellie, the layering is fab! Love this vintage collage card! Amazing!